Sadly I’m still struggling with sourcing my stash of stuff from the back of beyond among the stacks in my storage area. I’ve found quite a lot of other things along the way. If I were to doodle my still life I have Staedtler pens and Sharpie markers I bought in summer 2015 and still haven’t opened; I’ve found all manner of potential support for painting from watercolour paper to student quality high-street canvasses bought in 2011 and still in their wrappers unused. This summer they’ll get used – as soon as I can find my box of paints etc! And if they’re solid… I’ll scream and kick myself! So, along the way of my search I found myself wondering, what did I leave in this box? Is there anything in this box I could use for still life? Silly stuff for safekeeping in a ‘somehow sentimental’ box! [Visual description for the benefit of those who might be partially sighted.] Without rooting through to the underlayers of the box I found it holding a strange variety of items (from bottom left, working across, up and round…) there’s a red plastic shade from the first set of Christmas lights my Mum had given me around 1987 or 1988; a plaited scoobie string my daughter made a decade or more ago; a snowman with a severed head made in self-hardening clay by one or other of my children – I’ll remember who exactly when i find the other snowman probably in a different box!… a scrap of tissue paper from a school wind-sock project; these are resting on the colour stained foam insert from an emptied box of soft pastels that i actually used up as a student in the 1990s; above that on the right is a Mum badge my daughter made me from her Crayola kit around 12 to 15 years ago; above that is a snack noodle pot reused to contain various scraps and bits and pieces; top centre is my son’s size six suede moccasin slipper again from the early 1990s, I’ve no idea if I still have the other one(! ); a bottle of scent gifted me by my Mum so long ago that what little is left now smells awful but still in it’s original box; below that there’s my kiddo’s handmade christmas cracker decorated with a snowman; then a Hallo Kitty sticker and a plastic dinosaur straw holder from the late 1980s/early 1990s. Quite a lot of ‘S’ things but nothing I wanted to sketch. Onto another something else… I found some more of my sketchbooks and smaller folders of my loose sketches. If it weren’t for the limits of Still Life schema I could have shown drawings of street scenes or the Market square, the railway station, skaters at the ice stadium or the skipping figures of children I sketched while I was a school arts week volunteer. And if I’d thought about it sooner I would have consulted my spreadsheet index I had some help with a small few years ago to know exactly what to look for in what book or folder! Sharpen up (my) synapses! Although it’s not a still life sketch I’m showing the view looking through my Mum’s kitchen, drawn in 1985 when I was sixteen and still living at home but attending the local college as an art & design student for a short time until my ‘rare form of glandular fever’ recurred. This sketch has added sentimental value now that my Mum is no longer there and there’s no going back ‘home’. The next drawing was made in my best friends’ living room in the early 1990s and could be described as still life. In a way it’s a shame that the paper’s coffee-stained. However it is the coffee that I was drinking at the time and made for me by my best friend. She died in 1998, so it’s another drawing of sentimental value. I used to love hearing her play her guitar while I visited, or playing mine when she visited my home. What strange sentimental or souvenir items do you have secreted away? Do you make your own things as ‘souvenir’? Before moving on to Saturday’s post for the letter S, I decided I should post links of AtoZ blogs I’ve been visiting so far (listed by url so you can see your destination, the blog’s title may or may not be the same). Some of those listed above are taking part in the #blogchatterAtoZ, perhaps instead of, or, maybe as well as the April A to Z Challenge (although most are listed in the main and/or daily sign-ups at the official A to Z site – number 1 in my list in this post). I’m sure I’ve probably visited some blogs that I’ve not included on this list and have to go back to notes made earlier in the month to add those in (maybe to a part 2 round-up list). In all truth I’ve not kept up with visiting all these every day, although I have for around half or more of them so far. I’ll make more effort to catch up with those I’m lagging behind with over the next few days. The last 4 are new picks to take a look at next, rounding up my part1 list to 50. Tomorrow, as a ‘rest’ day, I’ll hopefully take a look round the blogs for the other A to Z volunteer team members and maybe get time to add a few blogs I’ve not seen yet. 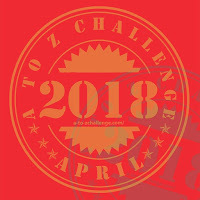 With 697 signed up at the main A to Z Challenge listing spreadsheet there are more to choose from than any one reader can get through in a month for sure! However there are also some listed in the main form who appear not to have been posting at all this month, so the daily forms are a safer bet – if you find page not found it’s probably a link for a scheduled post that hasn’t gone live yet. Rumour has it there’ll be a ‘road-trip’ after the challenge finishes so I hope I don’t run out of reading energy while I steam ahead as steadily as I can manage this month. Phew, almost three quarters of the way there and happy to say I survived (so far) the early frazzling out between weeks one and two – and I’ve been getting more meals as brain-drain requires better fuelling. PS: not wanting to confuse the reader, but as well as my postings here for the official challenge, I’ve been blogging alphabetically at TWO more of my blogs: (a) with a quick word and daily sky snapshots at coleebeatsabout.blogspot.co.uk to a slightly different schedule with no resting day so today reaching ‘U’, and (b) with a simple limerick poem each day at swishing4th.com, currently at ‘T’ and posting for ‘U’ later in the day.